Using tunneling ionization and ultrashort laser pulses, scientists have been able to observe the structure of a molecule and the changes that take place within billionths of a billionth of a second when it is excited by an electron impact. Oleg Tolstikhin, a Russian physicist from MIPT, and his colleagues from Japan and China have discovered a method of "looking" into molecules and obtaining information about their structure using electron interference patterns. They also conducted an experiment demonstrating the ability to track changes in a molecule during the transition of an electron to an excited state. The findings were presented in two papers published in Physical Review Letters. Tolstikhin and his colleagues are working in the field of attophysics – a science which looks at very fast processes (1 attosecond, as = 10^(-18)s) such as the restructuring of electron shells or the displacement of atomic nuclei in molecules during chemical reactions. Their main objective is to learn to recognise how the structure of molecules changes with attosecond time resolution. i.e. billionths of a billionth of a second. One method is to use tunneling ionization. A strong laser pulse is directed at a molecule, which causes electrons to break away due to the quantum tunneling effect. As we can say with certainty that ionization took place within a small fraction of a laser cycle (the duration of one complete oscillation of the electromagnetic field in the laser irradiation used at a wavelength of 800 nm is approximately 2.5 femtoseconds), the proposed method allows scientists to observe rapidly occurring processes within the molecule. "Attophysics is currently a "fundamental science", but we are still able to suggest a range of applications: by knowing the way in which a shell configuration changes, or the way nuclei move during a chemical reaction, we can "shoot" a laser in the right place at the right time to produce a controlled outcome in a chemical reaction," says Oleg Tolstikhin, Chief Researcher and Associate Professor of MIPT's Theoretical Physics Devision and Head of the Attosecond Physics Group. The first paper describes an experiment in which and his colleagues from Nagoya University and The University of Electro-Communications in Tokyo used few-cycle laser pulses of different wavelengths to irradiate molecules of nitric oxide (NO). A weak UV pulse excited an outer electron to a higher state, followed by a strong infrared pulse creating a field in which the electron escaped from the molecule due to the tunneling effect. After breaking away from the molecule in the strong laser field, the electron returned and was scattered on a molecular ion, which resulted in the molecule dissociation into a positive nitrogen ion and an oxygen atom. The scientists then measured the momentum distribution of nitrogen ions for the ground and excited initial initial states (Fig. 1). From this image, the scientists were able to track the dependence of the rate of tunneling ionization on the orientation of the molecule with respect to the laser polarization direction. It was found that in the ground state of the molecule, tunneling ionization is most likely to occur when the axis of the molecule is at an angle of 45° to the direction of the oscillation of the electric field, and in the excited state the distribution is almost isotropic, i.e. the same in all directions (Fig.1). The results of the experiment are consistent with the predictions of the weak-field asymptotic theory of tunneling ionization. The good agreement between the experimental results and the theoretical calculations, and the high time resolution suggest that the method could potentially be used to visualize molecular configurations in real time, which means they could be observed dynamically and controlled effectively. The second paper is purely theoretical. It examines the development of a new method that enables scientists to "extract" structural information from spectra of photoelectron scattering in tunneling ionization of an atom or molecule. The numerical experiment is similar to the real experiment conducted with nitric oxide: the atom is irradiated with a strong femtosecond laser pulse. But instead of a momentum distribution of N+ ions, the scientists studied an interference pattern of photoelectrons that had tunneled from the outer shell of the atom. Certain ionized electrons ultimately have the same momentum and this means that they are able to interfere. The time in which the photoelectrons are able to fly "back and forth" in a laser field and return for rescattering on the parent ion is comparable with the length of the optical cycle of the laser (a few femtoseconds). However, the observed interference pattern has a much narrower "time" structure – it encodes processes that last for attoseconds. This means that it is possible to observe what happened with an atom or a molecule in the time between the tunneling of an electron and its return to the ion with attosecond resolution. Previously, scientists demonstrated that the momentum distribution in an experiment with tunneling ionization contains a stable interference structure that must store information about the composition of the parent ion. This structure was called a photoelectron hologram, similar to an optical hologram. However, precisely what structural information is encoded in the hologram and how to decode it from there was still a puzzle. Oleg Tolstikhin and his colleagues from China and Japan provided an answer to both of these questions. Optical holography allows you to reconstruct three-dimensional images of objects. The physical basis of the method is to record an interference pattern of waves coming from a source (reference wave) and reflected off an object (object wave). The structural features of the object alter the phase of the object wave, and the interference pattern stores this information — the volume and "structure" of the object recorded on the hologram. In photoelectron holography, instead of a reference wave there are electrons that fly directly to a detector after the process of tunneling ionization. And the object wave corresponds to electrons that, on their way to the detector, are first scattered on the parent ion. It was found that the hologram encodes information on the phase of the elastic scattering amplitude of the electron on the ion. This phase can be used to restore the structure of the ion. The results of the numerical calculations very well agree with the predictions of the adiabatic theory, which confirms the validity of the theoretical conclusions made. "In our study, we consider a model atom with one electron — but this is only to simplify the calculations. 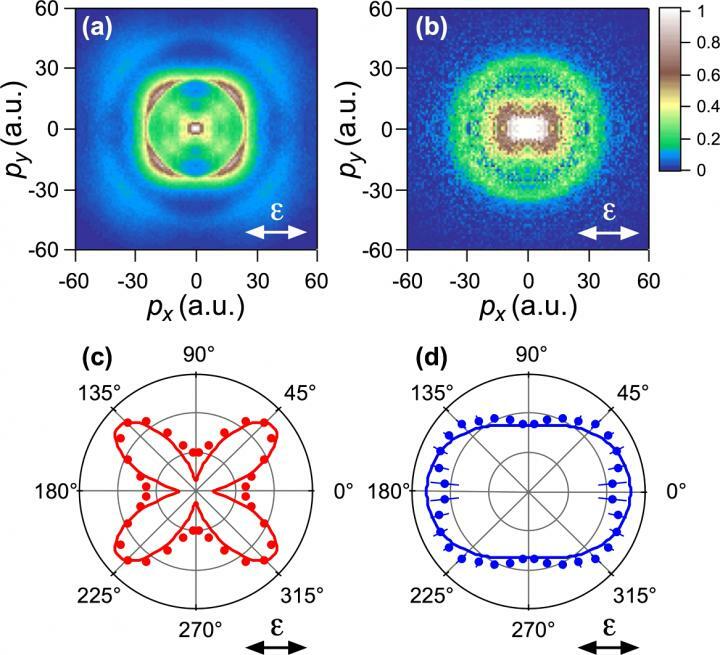 We demonstrate the principle of extracting the phase of the complex scattering amplitude from the photoelectron momentum distributions and this procedure should apply to all atoms and molecules," says Oleg Tolstikhin commenting on the study.